Add a sense of light and space to any room with pieces from this sublime collection of mirrored furniture. 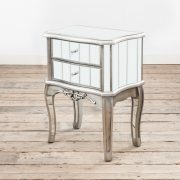 Order Now from COCO54 Annebelle Mirrored furniture range which includes everything from console tables to storage units. From exquisite mirrored bedroom furniture including mirrored bedside tables, mirrored chests of drawers and console tables, there is something available to bring that wonderful elegance to your home. French mirrored furniture is an excellent choice for anyone who is interested in light designs and wants to bring out some of the other features and furniture within their room. View Basket “Annabelle Venetian Mirrored Gunmetal Silver 2 Drawers Bedside Table” has been added to your basket.